The driving force behind the ‘Passive Butterfly’ home was to create an exemplar for transforming heritage Australian homes into beautiful and super-efficient passive houses for the 21st century, whilst retaining the heritage aspects of the building. An unprecedented energy efficient and sustainable design approach refreshes this heritage home to holistically create joyful and beautiful spaces. The design optimises spatial efficiency, while maintaining a compact footprint, generates more energy than it requires, and re-uses collected rainwater for toilets and the productive garden. In order to create the northern aspect, the extension was conceived as a butterfly roof pavilion, cleverly linked to the old building. To optimise the spaces, the link between the existing heritage and new extension becomes the kitchen to remove hallways and minimise “circulation only” spaces. Passive Butterfly is a prototype and exemplar in sustainable and holistic retrofits of heritage homes to exponentially improve their long term efficiency and lifespan. It showcases what is possible in terms of a holistic upgrade to Passive house standards. Carefully modelled and tested to ensure year-round comfort, the design uses a passive design approach to ensure vastly improved comfort and super-efficient thermal performance. The heritage home was retained, however existing windows were upgraded to triple glazed. Existing walls, floors, ceilings and roofs were also upgraded with new insulation to ensure air tightness. 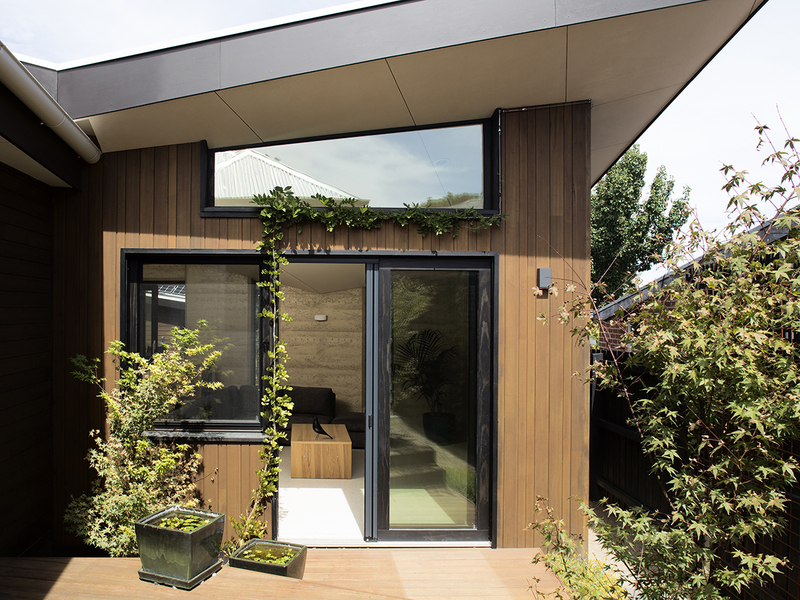 With a flexible and efficient plan, a home office and productive veggie garden, the ‘Passive Butterfly’ is an archetype for sustainable, healthy and happy living. The asymmetrical butterfly roof design was not only developed to be a beautiful architectural form, but also a functional way of getting sun into a light-starved extension by optimising solar access both internally and externally. The folds in the roof form allow for hi-light windows to be inserted into the living room, and the roof’s apex and valley positions work to thread light into spaces and onto internal thermal mass. The Sustainability Awards is Australia’s longest running and most prestigious awards program dedicated to acknowledging and celebrating excellence in sustainable design and architecture. Nominations received are shortlisted and then winners for each category are announced at a five-star Gala evening hosted this year at the Star, Sydney on 11 October 2018. The daytime event Sustainability Live is a CPD-endorsed education event where industry experts present a range of topics to educate, inform and ignite learning. Buy tickets.